Mary Whitehouse was born in Staffordshire in the year 1815, her father was the owner of a brick-field, in comfortable circumstances, and a Puritan of the severest type; her mother she could not remember, having lost her before she was seven years old. Her step-mother was anxious to leave the kiln and potteries, so in 1823 the family removed to Hammersmith, London. Her childhood was not of the happiest, a stern father and an unsympathetic step-mother caused her at the age of eighteen to leave home never to return. In 1835, while a patient in the London Hospital, she saw her condition as a sinner, looked into the face of Christ and obtained forgiveness. In 1839 she was married to William Stubbs, a medical botanist, but it was a union which brought no satisfaction and proved a great mistake. During this period she sought and found our chapel at Cooper’s Gardens, and there, in the midst of trying circumstances she found great peace and comfort in her association with God’s people. She was permitted to rear two of her children, a son and daughter, but at the age of thirty they both passed away. 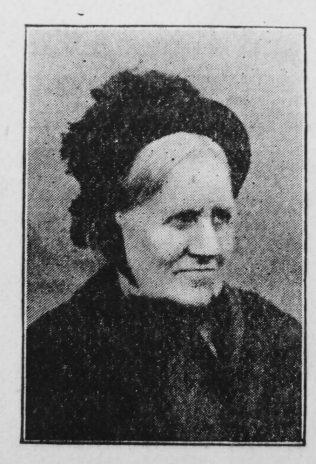 About the year 1841 she removed to the neighbourhood of Sutton Street, and was not long in finding out our chapel, and joined the Society there, and became one of the foremost of the zealous workers who at that time constituted the church. The stories she could tell of the early morning and other services in the days of the Rev. George Lamb and T.S. Nullis, were thrilling and inspiring. Her home was always open for the accommodation of the preachers, and many a time she sheltered them and made them as comfortable as her circumstances would allow, for she believed that whatever sacrifice was made, the silver and the gold belonged to the Lord. In the year 1859, she had a great desire to give herself entirely to the work of God, hence with great fear and trembling she offered herself to Mrs. Raynard, the founder of the “London Bible and Domestic Female Missions,” one of the most valuable agencies in London. Such was her earnestness and diligence in this sphere that she became one of its most trusted and faithful workers, and was often sent on errands where only her fearless love for the sinner could carry her safely through. She has gone to the rescue of women, wretched and drunken, who were being hooted at by a crowd of mischievous boys, and she has not rested until they were put into a place of safety. One day, soon after she became a Bible Woman she went to the top room of a house in Stepney Causeway. It was a large garret containing a mother with five children; the woman’s hair hung down her back, very much matted, and all her clothing consisted of an undergarment with a piece of bed-ticking, tied round the waist. Some of the children were almost naked, the others clothed in rags, and the furniture corresponded with the condition of the family. She had once been a beautiful woman, but had been for years subject to the ill-usage of a drunken husband, and now she was earning a living for herself and family by caning chairs; she had not been in a place of worship for fifteen years. Mrs. Stubbs obtained clothing for them, and invited the mother to her meeting; and when she sat down to tea she fairly broke down, for that was the first kindness she had received for many a long year. She obtained a Bible, gave her heart to God, and soon had a different home, and when Mrs. Stubbs saw her some time afterwards she was still at her old employment, but she was the picture of neatness and cleanliness, in a house furnished from top to bottom, living a good life and having the love of God in her heart. Early in the Sixties, during the time of the Cotton famine she was sent into Lancashire to feed the bodies and souls of the starving mill hands, who testified their appreciation of her efforts by subscribing their pennies and even farthings, and presenting her with a splendidly bound copy of ‘‘Fox’s Book of Martyrs,” also while there she had trained several Bible-women for work in Lancashire, who have carried the Gospel into thousands of homes. After having been many years connected with our Sutton Street Church, she removed to Poplar, where she became a Leader, and one of the most earnest workers in the Chrisp Street Church; her great sympathy and compassion went out towards the suffering and degraded population of that part of London, and many were the trophies she won for the Lord Jesus Christ. What she did for our church at Sutton Street and Poplar no one will ever know; every department of Christian work found in her a helper of no mean order, for whatever she undertook, she did well, and possessed such grit and perseverance that she succeeded where others faltered and failed. The drink traffic found in her an implacable enemy, she saw so much of its ravages that she could not abide it at any price, and hurled her anathemas against it right and left. Inconsistency in the Christian Church was to her a source of great grief and caused her to urge the young people to consistent conduct and faithful allegiance to the Lord Jesus Christ. She worked on in this fashion until nearly eighty years of age, and only because strength was failing did she relinquish her duty, and then most reluctantly. Her last days were spent in the home of her granddaughter, who cared for her with all tenderness and love until the Master called. Census returns suggest that Mary was born in Stafford, but I have not identified a baptismal record, and therefore have not been able to identify her parents. She married William Stubbs (abt1816-1861). Census returns identify tow children.